Babies tend to spend the most amount of their time in cribs. Thus, it is a good idea to have some toys in the crib. They keep the baby engaged and entertained so that they get to enjoy a relaxing sleep when exhausted. Besides, toys can also be an excellent way to help your baby develop motor reflexes, concentration, teething relief and assist with their overall cognitive development. 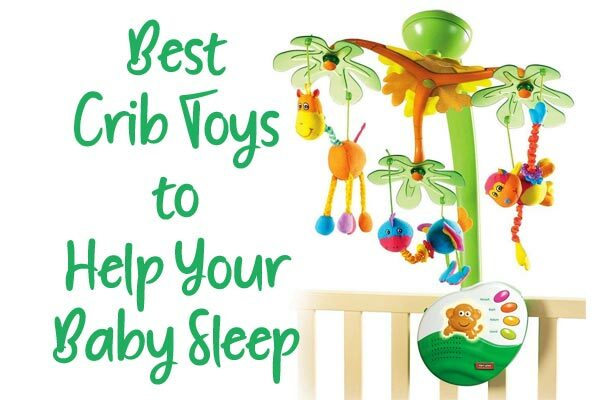 So, in this article we pick the Best Crib Toys to Help Your Baby Sleep. Read on. Unlike the common misconception that toys can disturb the baby’s sleep, there are endless toys available that are sleep-friendly and can help your baby with sound sleep. Sleep-Friendly crib toys can often help your little one soothe themselves to a cozy &blissful sleep or act as creative stimulants to keep your baby engaged for a specific period. How to pick the Best Crib Toys to Help Your Baby Sleep? In general, crib toys engage or allow the babies to get some sleep. Thus, an ideal crib toy should not make much noise or light-up. It should be relatively soft with rounded corners, to avoid any injury to the fragile body of the baby. Talking of softness, it is advisable to avoid the typical soft toys and teddy bears in the crib. The baby may hug on to it leading to the risk of SIDS (Sudden Infant Death Syndrome). Choose a crib toy that gives your baby enough space to breathe while keeping him engaged and entertained. This is an entirely “go-to” toy for babies showing signs of teething. The combination of soft and hard keys on a fancy looking key ring, provide various textures to enhance teething while soothing your baby’s irritating gums. Unlike the water-filled teethers, this icy pack teether contains a safe gel-like material. It allows it to stay cool for a longer period and helping your baby drift into sleep while chewing on it. Moreover, the bright colours of the huge-shaped keys are sure to attract your baby’s attention and help them in stimulating the sense of sight. Besides, the critical design of the toy makes it easy to reach the back teeth. Babies love to have a cozy cuddle buddy in their crib, and thus, every baby is bound to fall in love with this Kakasa Baby Lamb Blessings Wubbanub. This cute, furry, baby lamb standing roughly half a feet long is of the perfect size for your baby to enjoy a warm snuggle as they sleep. The baby is a stuffed toy with a soothing pacifier. The manufacturer has named it Wubbanub. The soft toy ensures that your baby doesn’t get hurt while cuddling it. This cute little toy is also great for helping your child develop social skills as they start interacting with the toy. It is tested under US Safety guidelines. An excellent crib toy to be gifted to growing babies, the Kick and Play Piano Gym can easily be attached to a side of the baby’s crib, for babies to enjoy as they kick on it. You can also placed it on your baby’s play area for babies to play while lying on their tummies. The soft and large piano keys activate a light switch as the baby kicks and touches them attracting the baby’s attention. This versatile sleep-friendly crib toy is excellent for developing the leg muscles of your baby and also for developing tummy muscles. They are significantly essential for your baby’s early stages of development. The constant kicking can exert your baby to a sound sleep. The Sassy Development Ball comes with multiple bumps on its surface. Each bump is brightly coloured, made of different material and featuring highly contrasting bold patterns. The bumpy ball produces a soft rattle sound when squeezed. It is aimed at developing 3 significant senses of your baby – a sense of touch, sight, and hearing. The different materials of the bumps trigger your baby’s sense of touch, the bright colours trigger the sense of vision, and the gentle rattle sound triggers the sense of hearing. With all 3 senses working constantly, the baby falls asleep quickly. Your baby is going to love this adorable Tiny Love Take Along that comes with 3 colourful and lovable animal characters hanging down on the baby’s crib. You can quickly attach the toys to any baby furniture like the crib, bassinet, stroller, etc. It plays a soft 30 minute relaxing and soothing music that can lull your baby into a sound sleep. The toy comes with 20 hours of battery life to help your baby sleep for hours. It automatically shuts off to save the battery life. The cute hanging animals are great for providing visual stimulation for the baby. An ideal crib toy for your baby would be something that is lightweight and that your baby can quickly grab in his fragile hands. The Hug and Tug Musical Bug is a lightweight, lovely green caterpillar . It comes with a mirror forming its ears and 2 cackler rings. It allows your baby to discover various textures through sensory stimulation. The body of this cute caterpillar recoils to its original position and shape after the baby pulls it downwards. As it recoils to its normal state, 90-second long music starts playing. And, that triggers the baby to pull it down again and again and exhausts him to take a sound sleep. Something is enticing about the calmness of a tropical island that even babies tend to love. This Tiny Love Sweet Island Dreams Mobile is specifically designed to mimic the warmth of a tropical island, with palm trees and a playful monkey, a colorful giraffe and a bright bird, each dangling independently from the palm fronds. The mobile toy also plays a beautiful 20 minute non-stop music. At night, the toy can double up as a soothing night light. It can be a great way to help your baby sleep while listening to the music.